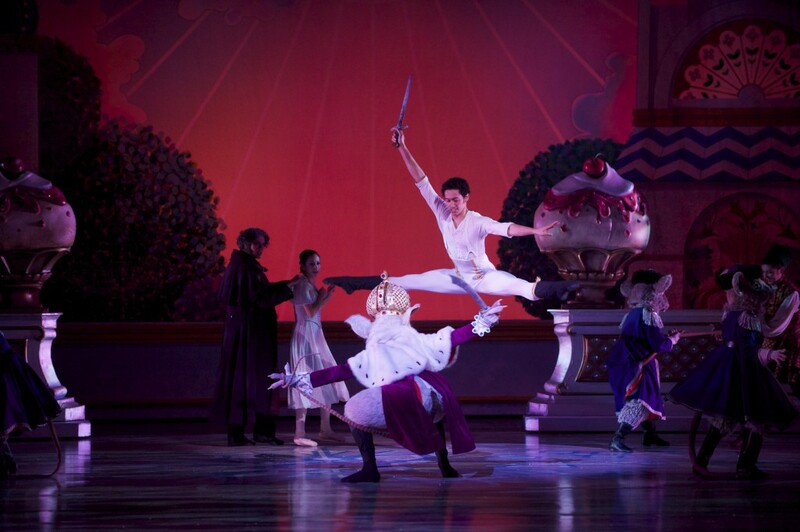 Yes, its magical, but it’s the dancers’ unreal athleticism that makes the show go. Erik Johnson and Alexandre Ferreira. Photo by Mark Frohna. 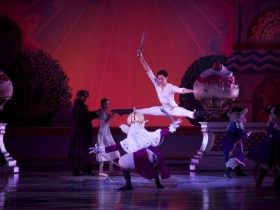 This weekend’s opening performance of The Nutcracker delivered all you would expect of the Milwaukee Ballet’s long-standing holiday show. 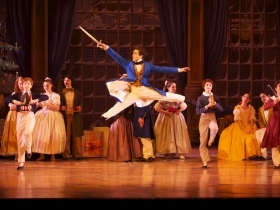 The enormous cast, the beautiful sets and impressive costumes, not only in their design, but the sheer amount of them, help create a big, glittering production anchored by a ever-changing array of well-performed dances, all set to the magical score by Tchaikovsky, itself beautifully performed by the Milwaukee Ballet Orchestra. So it’s easy to take all this for granted, perhaps even to be a bit disappointed that the production is so similar to what it was last year. 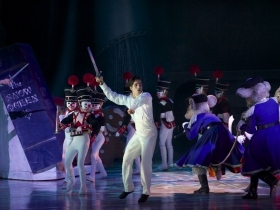 In the process, you may overlook the thing that makes The Nutcracker so special and worth seeing more than once: the unreal athleticism of the company’s dancers. I spoke to Kahla Hendricks, Licensed Athletic Trainer who works annually at the holiday production of The Nutcracker and full-time as a Performance Enhancement Specialist at Froedert. And while I suppose I was fishing for confirmation that yes, a Kevin Ware-type situation could occur at any moment on stage, (Ware was the University of Louisville basketball player who broke his leg in a crucial NCAA tournament game) the truth is that these dancers work overtime to ensure this is a rare possibility. It will come as no surprise that the dancers dance, hours a day, to maintain peak strength and conditioning. But they also undergo special performance enhancement sessions, particularly using non-weight bearing plyometrics, to keep their own weight from interfering too often with their workouts. As it was explained to me, the dancers are essentially jumping without ever landing on their feet, using sort of an advanced pilates machine. In this Milwaukee Ballet “Season of Classics,” it’s safe to assume the dancers will mostly be using the pointe technique that is the classic image of ballet – something that while they’re well-suited and trained for, still means practicing in unnatural body formations that leads to potentially painful overuse. The Genesis series will likely see more “flex” work from the company; a modern take on dance that presents a new challenge as the dancers break from their traditional molds and re-train their brains and bodies to perform quite differently. Of course, this is a company of top dancers from across the globe, who are well aware of their own bodies and train hard to be able to perform in every style. 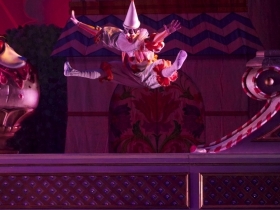 In The Nutcracker, the Rat King and the clowns are perhaps the most challenged performers. The Rat King moves throughout his several appearances with a very heavy piece of costuming on his head, expected to jump and dance and act and hit cues flawlessly regardless of the obstacle. The clowns perform the most athletic appearance of the evening, bursting from offstage with unbelievable vertical jumps and generally entertaining us with non-stop aerial, acrobatic feats. Both tests of endurance send the dancers backstage exhausted but ready to charge forward again for their next cue. Often, these are near 12-hour days for the company. But all that physical exertion never shows on stage. 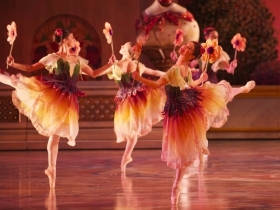 The Nutcracker is about conjuring magic, and once again, this year’s production delivers, as only a company with such a dedicated and talented group of international dancers can.